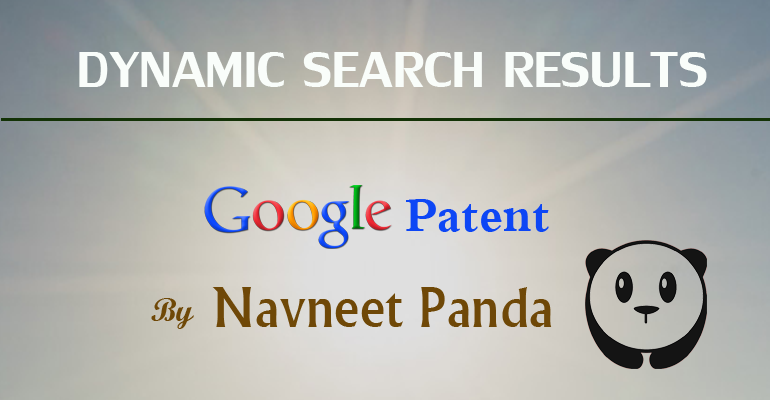 Navneet Panda, the Google Engineer, is behind Google Panda algorithm that aims at refining search results by removing low quality & thin contents. Recently he was behind another patent filed by Google named “Dynamic Search Results” which was published on 18th June 2015 that aims at providing dynamic search results to users for searched queries. It means even if the search query is not changed, the search result will be changed after a specific time if the user is not satisfied with the first set of search result. The search results that we are getting now can be called as static search results as it remains there as long as the query is not modified or changed by the user. 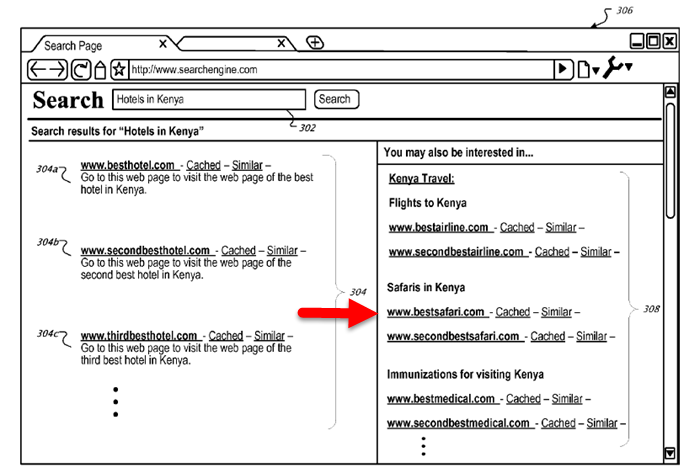 But as per this patent, the first set of search results will automatically be replaced with a second set of search results depending upon user behaviour model that to without changing the query from user end. 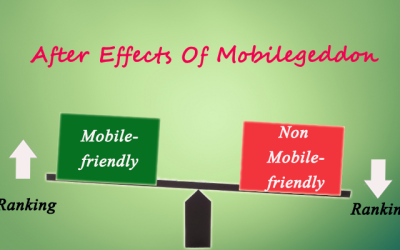 That’s why it is termed as dynamic search results. It’ll something like when user will submit a search query, a first set of results relevant to the query will be visible to the user and if the user will not select any results within a specified time then the search engine will automatically modify the query & will provide a new set of search results which will replace the first set of results or may show in addition to the first set of results. It could be something like the below image, Google showing a dynamic search result in addition to the primary search result. 1. 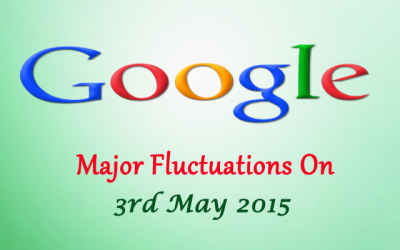 User submits search query & a first set of search results will be visible on user device at a first point in time. 2. Detect a second point in time till when user has not selected any results. 3. Determine the particular first set of results that have been viewed by the user between the first point of time and the second point of time. 4. Obtain second set of search results that are different from the first set of search results based on the information associated with the first set of search results that were determining to be viewed by the user and provide the new set of results on the user device before the user has click on any of the first set of search results. 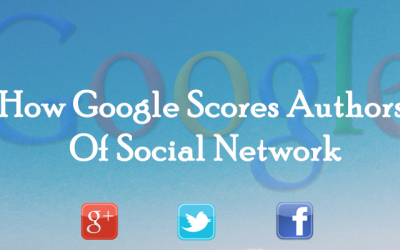 To obtain dynamic search results, it has created a user feedback model. 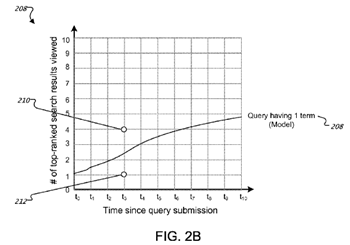 The user feedback model can be used to estimate the number of top ranked search results that have been viewed by user at a given point of time following submission of a query of a given number of terms. 2A is for single term, 2 terms & N terms queries whereas 2B is for a single term query and a user’s search result selection behaviour. If the user has not selected any of the search results at the given point of time, the search results can be refined automatically for user based on the number of top-ranked search results estimated to have been already viewed by the user. Calculate the time difference between when search results visible to user and when the user initiates a click on any of the search results. It can be assumed that the user has viewed all the preceding search results within that time gap. 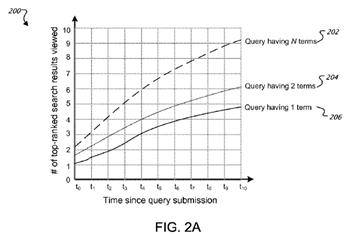 To determine the function for a query of a given length, historical search activities of user data can be analysed to determine when users tend to select search results for queries of a given number of terms. Alternatively or in addition, user’s scrolling behaviour can be used to estimate the number of search results that is viewed by the user. When a user scrolls to view the hidden search results below, it can be assumed that in that time the user has viewed all the top search results in addition to the first hidden search result. Even historical search log data can be analysed for given search terms to find out the average time taken by users to select any specific rank results. For example, how much time taken in average by users to click on result no. 5 for 2 term search queries. First of all the search system will use user feedback model to automatically refine search results for users who have not selected any of the search results within a given period of time. When users will view but will not select any search results, then those results can be considered as rejected resources. The search system will use those resources and or contents in those rejected resources to reorder search results or to refine search query to obtain different set of search results. In some implementations, the search results are refined by reordering them according to the number of key terms contained in the content of resources identified by the search results. The position of a search result can be moved down the page according to the number of key terms contained in the content of the resources, so the more keys term contained in the content of the resources, the more the position of the search results is likely to be moved down the page. In further implementations, new set of search results will be automatically obtained by using a revised query. Normally search system assigns weight to the terms associated with search queries. By adjusting one or more associated weights, new query can be obtained. Well, the dynamic search result model is purely based on users’ behaviour; with it Google will try to judge their intention and will modify the search results by adjusting the query. So, there is seemingly no scope for marketers to do something about it. But still two things come to my mind; one serious (not so serious!) and other one a funny thought. First, suppose your site is in viewable part of search results for a relevant query but the user is not interested or satisfied upon seeing your information. You may have the relevant information on your page but a user will see only the title, URL and meta description in the search result and decides what the content may be present inside. In some cases Google modifies the title & descriptions. But whatever the case may be, all the relevant information related to the search query can’t be presented in these three features itself. So, at most you can try your best to express all related ideas in these three features. GOD knows how that can be possible! Well, at least you can try that. But your main purpose should be to include quality content in the page and try to add as much information regarding it in that page. Google can sense that and may modify the titles & meta descriptions as per the query so that a user may take interest in your URL. The funny part is; is it the death nail to search volume based strategy. 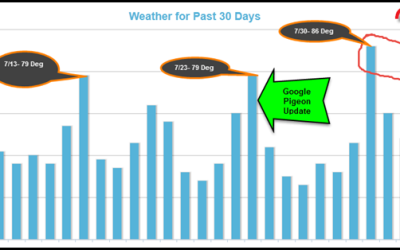 More often, SEOs try to focus on keywords with more search volume while optimizing the content, title or description. Now as Google with its dynamic search result approach is going to modify the search results by adjusting the query, so the users don’t have to search for other queries. Now, in such conditions, may be the search volumes of closely related terms are likely to be decreased. For example, a user is interested in seo tutorial. While searching for it, if he comes to the term SEO training in the search results, in present scenario, he may further wants to refine his search with SEO training. But with dynamic search results approach, Google will provide the second set of search results by adjusting the query to “SEO training”. So the user doesn’t have to search for it. Now, that may affect the search volume. Funny one, isn’t it?